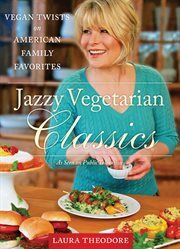 The item Jazzy vegetarian classics : vegan twists on American family favorites, Laura Theodore, (ebook) represents a specific, individual, material embodiment of a distinct intellectual or artistic creation found in Charlotte Mecklenburg Library. Plant-based recipes for yummy comfort food, from the popular public television host! With quick-to-prepare gourmet-style dishes, Jazzy Vegetarian Classics features Laura Theodore's original creations, such as vegan shish kebabs and cauliflower steaks with sweet pepper sauce, and other spins on time-honored favorites, from spaghetti and "wheatballs" to decadent chocolate-ganache cake. Filled with easy-to-follow crowd-pleasing recipes, this cookbook will make nutritionally dense and plant-based dishes your new family favorites. Fun and simple to incorporate into anyone's lifestyle, Jazzy Vegetarian Classics provides wholesome full-menu plans for everything from weekday meals to special celebrations such as parties and holiday dinners. Laura even includes suggestions on how to present appetizing, plant-based meals in unique and festive ways, with her "Jazzy Music Pick" for each menu to help set the mood. Jazzy Vegetarian Classics also includes beginner-friendly guides to the basics of vegan cooking coupled with a glossary of common ingredients, and simple instructions on how to use a variety of substitutes for "veganizing" timeless main dishes, desserts, soups, salads, and so much more. Put on some good music and embrace a healthy, delicious, and jazzy lifestyle!